This is our first full summer in Orlando. While my husband, Justin, is totally used to this crazy Florida heat, Maisy and I were both born in the Midwest and this kind of heat is oh so totally new to us. Recently, as temperatures have started to climb, my rambunctious 1-year old wants to do everything outside. Unfortunately for me she doesn’t share my same love of sitting in the heat with a margarita which as tasked me with the creative challenge of providing her with plenty of safe, outside activities for our tiny little porch that can keep her cool and, equally importantly, occupied. 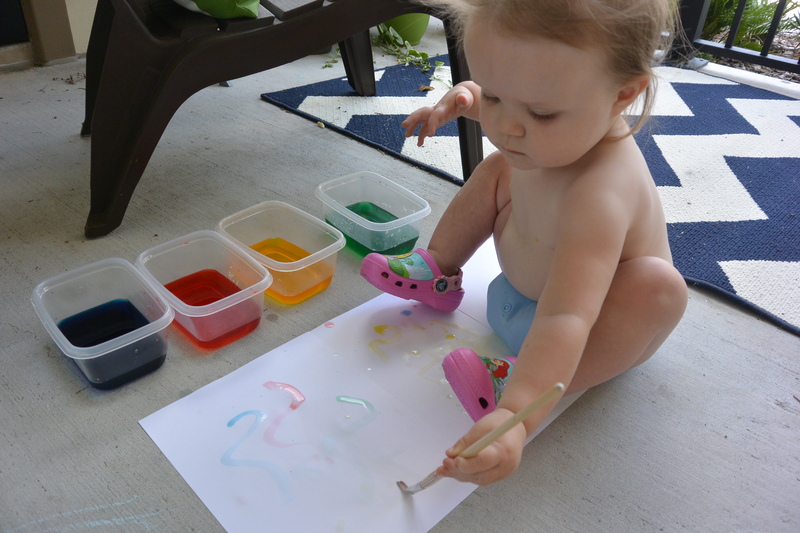 Maisy finger paints quite often at daycare but since one of her favorite pastimes involves re-coloring my patio furniture with chalk, I wanted to give her something to express her creativity that wouldn’t make a mess. Enter the easiest outside activity ever. Get ready for a summer full of watercolor paintings. Food coloring goes into the water. You’ll need about 6-7 drops to get a rich color that will show up on paper. That’s it. Super super easy. I filled the containers with cool water. Maisy calls this Juice painting. Share your favorite summertime activities for toddlers in the comments below, or on Pinterest!